Yes, I will be giving away a ride-on lawn tractor ($999 MSRP) to one of my lucky readers this week. But first you have to listen to me rant about how hard it was to push a walk-behind mower to school both ways every morning in waist high snow, and then you'll let me explain why the Neighborhood Rider actually makes lawnwork fun again. Mrs. Rainforest Gardener and I had a blast zipping around mowing the apartment complex and taking photos! 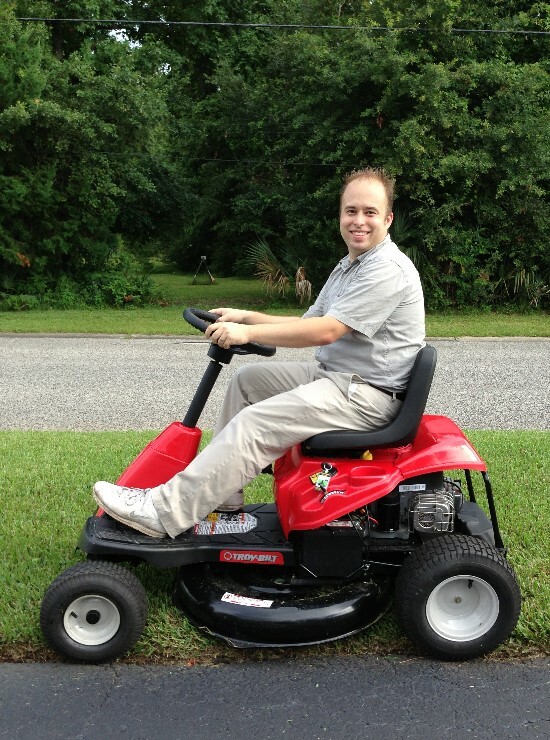 Disclosure: As a #Saturday6 blogger I received a mower as part of the reimbursement for my services to Troy-Bilt. 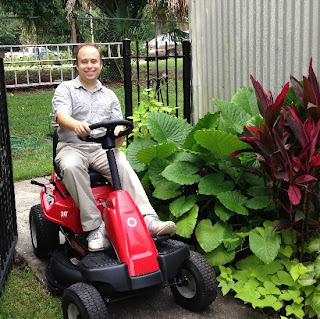 I chose to review and give away this mower because it is a product that I am very excited about and feel fits the needs of The Rainforest Garden's readers. The last time I mowed the lawn, I was in fifth grade and uttering my first swear words as I pushed through the sandspurs of our lawn in the middle of the Mojave desert, dizzy from the heat, aching all over and blistering all across my palms from the jolting vibrations of the handlebars. I remember daydreaming about jackrabbits and desert tortoises whenever I looked at the icons on the mower's speed settings, and daydreaming about a life without lawnwork whenever I collapsed on my bed, flushed beet red from the heat and sun. I actually think I might have mowed the lawn in high school too, but must have blocked it out from some reason or another. This is definitely NOT the mowing experience I remember. We'll soon be buying our first home (yay us! ), but I don't have to live in fear of heat stroke and blisters anymore. 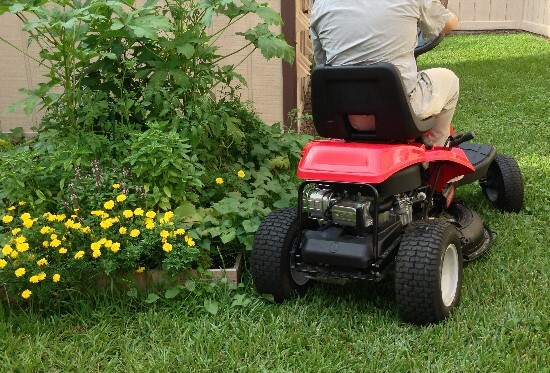 Whatever lawn we end up with, the Troy-Bilt Neighborhood Rider will make mowing it just as casual as hopping into the car for a spin, which is pretty surprising for a lawn tractor. I mentioned in a previous post that I had a fear of lawn tractors (I know! I have issues.) and considered them too large and unwieldy for a small lawn, but when I tried it out for the first time I was pleasantly surprised with its handling and finesse. It even has the same footprint as a pushmower with the handlebars extended, making it an easy fit for cramped corners of the lawn, garden gates, pathways and the garage. I'll likely replace much of my grass with gardens, but the Neighborhood Rider is convenient enough to make it worthwhile for even the smallest lawns. If I decide to help a neighbor out with their lawns, I'll have saved enough time to drive the mower down the street, zip around their yard and get back home in time for supper. The neighborhood rider turns on a dime around my apartment veggie garden. I would much rather spend my time gardening than worrying about the lawn, so the Neighborhood Rider's speed really comes in handy. And yes, I do intend to replace much of the lawn with groundcovers, but the Neighborhood Rider will make it easy to maintain the lawn as I slowly whittle it away for vegetables and groundcovers. I also plan on letting the grass on my new lawn grow a bit taller in the back than usual, which would could make a walk-behind pushmower a pain in the patootie. I did try out some of Troy-Bilt's walk-behind models in Arizona, but I would still prefer to just hop into the cockpit and cut the grass before work without getting my clothes dirty. As silly as that sounds, there's something to be said for mowing the lawn without needing a shower and fresh change of clothes, especially in the sultry heat of Florida. Mrs. Rainforest Garden likes a clean man. Mrs. Rainforest Gardener was doing something to make me smile for this photo. I forget what it was. What I like about this lawnmower is that it has all the power and convenience of a lawn tractor, but with the size and maneuverability of a push-mower. The rear-engine configuration and sleek body of the Neighborhood Rider give it the quirky 'Meet George Jetson' appearance of a Smart Car, but it isn't until you take a seat that you really start to appreciate something missing from bulkier models: Blind spots. You can actually see what you're doing, so well in fact, that MTD has given it the ability to drive in reverse. This is a big draw for those with cramped yards. 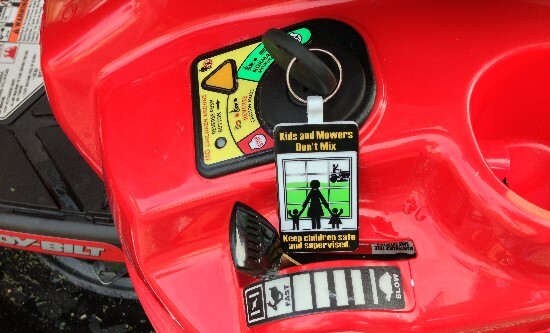 Mows in reverse, but with safety features for the little ones. I could go on about the substantial (but not too big) 30 inch deck or wax poetic about the pivoting frame and the responsiveness of the telescopic steering wheel, but my takeaway from trialing this lawnmower could be summed up in one word: Fun. It was just a blast to ride! 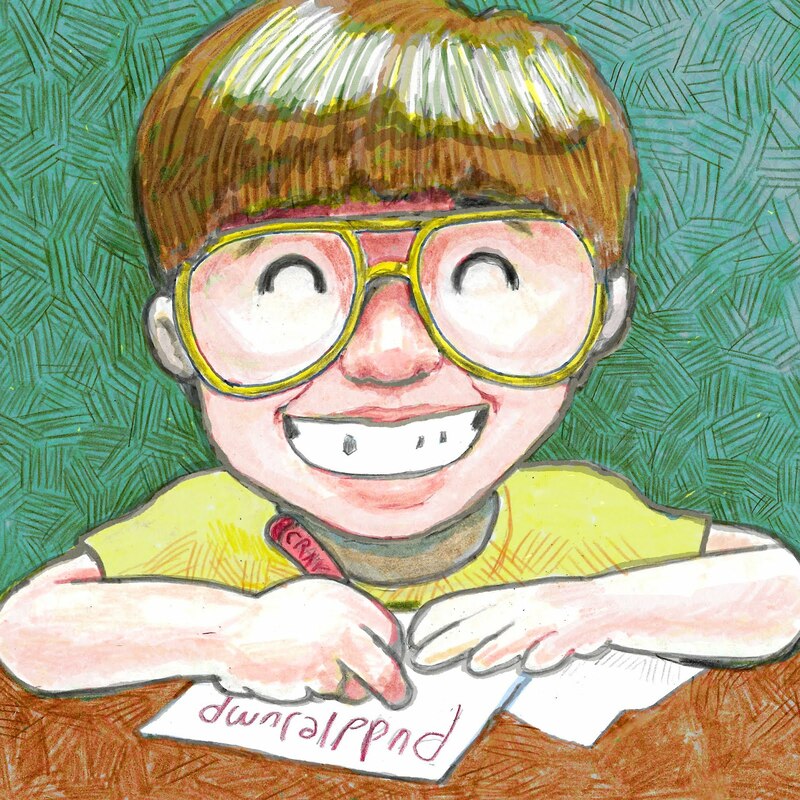 Don't take my word for it; here are some links to Matt Mattus' review and Amy Andrychowicz' review as well. Oh, and Amy is giving away a mower too! So here's what you need to do to win. Leave a comment telling me how this mower would make your life easier. That's it! You may enter one time each day for the next week until I select a winner on Saturday, August 3rd. The winner will receive a brand new Neighborhood Rider from Troy-Bilt! A new ride to mow the lawn--would be Great! Thank you for the chance to make it easier! Looks like a great mower! Could use a new one. Oh and be sure to leave a way to contact you in case you win! This is so generous to give away such a great prize. I think that I would have so much more time and energy to spend taking photos if I could get the lawn mowing done faster and with a lot less effort! Well, honestly this mower wouldn't technically make my life easier,but my hubby's as he is the one who faithfully keeps our yard looking spiffy.As of late though, he has been complaining,bringing up the fact that he needs to get a riding mower because he's not getting any younger...so I guess in the long run it would make my life easier! I am the gardener at our house. I love replacing the weedy sections with flowers though, I love our grass. There is quite a bit of slope to the yard and with my new bionic hips, next year it should be easier to navigate...but this year a riding mower would be great. Growing up it was always my brothers job, or my fathers job to cut the grass...I would love cutting the grass if I had a riding lawn mower! I sure would LOVE to surprise my Hubs with this riding lawn mower; he mows and hates it; I can't b/c of back surgery. We have a small-ish lawn. Thanks, Steve. Our rider is one we got free and it has to be 35 years old. This would make my life easier because my husband would be a much happier man! Impetus for the hubby to ditch his pile-o-project mowers. Need I say more? Thanks for hosting the giveaway Steve. Lookin' good on your new red ride by the way. I would love to win this because my lil sister is buying her first house and I'd LOVE to surprise her with a mower for her great new yard! WOW...Yes, this mower would absolutely make my life easier!! Currently, I load up a push mower in the back of my car and drive one hour to my parents house who are 82 years old and cut their grass. I would love to leave this mower with them and then I could mow anytime. After transporting the mower in my car, I have to put up with the smell of gas for days. Thank you for a wonderful giveaway!! I like that it is low to the ground, some of those riding lawn mowers are scary, looking like they would tip at the slightest incline. I always thought these were too expensive, but that price tag doesn't look too bad! Wow, this would definitely make my (and my family's) life easier!! I would love to have this to mow my parent's 1 acre lot -- they currently have a riding lawn mower that constantly breaks down, so they have to resort to a push lawn mower which takes forever! Awesome giveaway! I could really use this! What's it rains again (hasn't for 5 weeks) the lawn will start growing again like gangbusters. Steve, does Troy have a riding mower that runs on biofuel? I'm concerned that this mower may contribute to global warming. I would love to have this mower! I have a couple of acres and push mowing takes hours! We do have a riding mower, but it is literally 37 years old and very temperamental. I am not allowed to use it due to it being somewhat "fragile" and apparently I am a bit too impatient to treat it with kid gloves. So my weekends are usually spent mostly in the yard, walking back and forth, back and forth. UGH! Steve, I also hear they are working on a solar-powered riding mower, but am concerned how it would work on cloudy days. Have you tested it? This mower would make my life so much easier! I love to cut the grass. In fact, I won't let my hubby do it. I get mad when he does. The hour and a half that I take mowing the lawn gives me time to think and it is the one time that I am completely without disturbance. Please help me make my life easier! Finally got a brand new shed yesterday. I'd love to see a riding mower in it. Would love to win this, my husband is getting stoved up and this would make his life so much easier, he is a wonderful man and it just would be so nice with our big yard. This is our first summer in our new house, and our little push behind is no match for our new lawn. It takes me two days to mow! Front and side one day and back the other. It would be soo nice to have a riding one. Please pick me! I mow my lawn with a reel mower and it takes forever! I could use a riding mower because I have a lot of chronic neck/should pain that is made worse with mowing. And winning on August 3rd would be perfect since it's my birthday! What an awesome birthday present that would be! I would love to win this- it would be perfect for my lawn! I live in Florida and have not been able o mow my back yard all summer. It is too hot to push the mower around the yard and my son moved away so he can't help. I just manage to do the front enough to keep the City off my back. Here in Western NY we have been hit by monsoon weather and now the sun. Who knew the grass would take such a liking to it and grow at the speed of light! I would love to be welcomed into the modern era of a riding lawn mower! I do believe Upstate NY has turned into a rain forest this year. I'm sure a Troy-Bilt mower will help us keep it at bay. This mower would make my hubbys life easier then he could concentrate on all his other projects like building another pond. Hope to beat the heat of St. Pete - The lawnmower looks pretty sweet! yep, the perfect "girl size" mower! Plus, great for smaller yards! I need it! We live in Zone 8 NC. HOT AND HUMID. I am a MG, but hubby does our lawn (uh, rarely - but don't tell him I said that!). Our fence door to the back yard is not large enough for our existing older tractor mower, and he has to take things off it to mow our back yard. If we had this mower, I could mow the lawn myself, keep the lawn/brush down and reduce the likelihood of ticks on my dogs (and Rocky Mtn Spotted FeverJ). Seriously - we NEED this mower! I'm a lot like you, I hate mowing the lawn, but with a 1/3 of an acre, could never justify purchasing a riding mower. I never knew that there was a riding mower that was agreeable to smaller yards. We are using my brother's mower because we don't have one. This would be fantastic!! I think my husband would like having one of his very own. I really don't need a lawnmower for myself, but my friend, Moises, is in desperate need of a new lawnmower for his business. His lawnmower (as well as his truck) is on its last wheel and it's his only source of income to support himself and his wife. He's been in the US for a very long time (we attended his citizenship ceremony), but it just seems like he can't catch a break. He and his wife Carmen work very hard in the hot Texas sun just to make ends meet. If his lawnmower finally breaks, I'm not sure what they will do. Being able to see where you are mowing would be wonderful, especially when trying to mow around the raised garden squares. Not to mention all the other gardens. Quick mowing helps to cut down on asthmatic reactions too. Being the independent type I offered to mow the lawn as my husband wanted no part in it when we bought our first house, however he does insist on a lush, dense THICK lawn on our half acre. Now, I still don't mind the time spent mowing as its like zen time for me (I love the heat), but hubby has stopped my garden development so no more lawn restrictions, but the biggest thing is the vibrations from the lawn mower. See, my mom had been diagnosed with terminal cancer nearly 6 years ago at age 52. She knew I was miserable in my job and kept stressing the importance of doing things NOW. Long story short, I graduated from Massage Therapy School in December, got my state license in April and now, after spending the last two months that my mom had before crossing over, I'm ready to pursue my dream. I need to take care of my hands as much as possible in order to be good at my craft. Vibration reduction is a big deal. 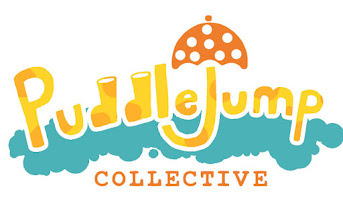 Thanks for a great article and this contest opportunity! I like your blog a a lot and your writing style. I'll be planting some ginger soon! Love the smaller size of this riding mower - much more appropriate for suburban lawns! We are 3 aging neighbors who share an older, bigger riding mower. Would love to gift our group w/ the new Troy-built Neighborhood Rider! We have a ten year old craftsman riding lawnmower that my husband uses. It is tempermental and always needing work done to it. I have a troy built push mower and love it. I'd love to have a troy built riding mower for my husband to use that is reliable. Plus not hearing him yell at the old mower would be a plus! We have a "hand-me-down, hand-me-down" riding mower for a huge sloped yard in a northwest Georgia neighborhood. That hand-me-down mower is *notoriously* unreliable, which means... yes... push mowing. Uphill... BOTH WAYS! And this being Georgia, that danged grass grows practically ALL YEAR. ::sigh:: A happy Troybilt would save me and my husband hours of wretched mowing in the hot Georgia sun! My mother is 85 and still loves to mow. Her tractor is to big to get around the trees, flowers and gardens. She still gets out and hand mows but has to take breaks. Needless to say it gets frustrating. She is happiest being outside working in the yard. I know it pains her to have someone else come in and do it for her. This mower would be a blessing to her. Of course we might have the problem of getting her to stop at dark. Does it have headlights? The in-laws just moved to a 5 acre property and a new rider would be an awesome house warming gift!! You do have quite a lot of great comments regarding why one would love a Troy-bilt riding lawn mower. I have a sob story but know my husband would not appreciate my putting it out in public Let me just say that we have a push mower to mow close to 2 acres of mostly lawn. He can not be out in the sun too long and so it takes us about 2 or more days of mowing. No complaints, it is what it is, but winning a riding lawn mower would make life easier. Thank you for the opportunity. Steve - You've completely sold me on it. "makes lawn work fun again"? "Meet George Jetson appearance"? "mowing the lawn without needing a shower and fresh change of clothes"? Gimme that mower! PLEASE! I enjoyed reading the article and your illustrations are spectacular - I had to look closely to assure myself that the one of the cone flowers(?) wasn't a photo because of the detail. I love my lawn, I love my flower gardens, I love my water garden and most of all I love my husband; the one who mows the lawn. As we get older, my husband thinks we should move to a condo where the lawn in mowed by an army of lawn care minions. That would give him more time to do the things he loves. If I were to win the Troy-Bilt Neighborhood Rider he would be zipping around cutting the lawn in no time. He would finish in short time fresh and ready to attend a wine tasting or cooking on his beloved charcoal grill. Did I mention condos require you use gas grills rather than charcoal? I put together a score card. As everyone knows Happy Wife = Happy Life. So winning the Troy-Bilt Neighborhood Rider would make our life HAPPY! This would allow our growing family to spend more time together and less time pushing a mower around the yard. With a two year old and one on the way and two parents who work full time each moment is precious!! Could I use this! Yes, please, mowing here is Florida with a walk behind is sweat drenching job. This would make it so much better for me, at 64 years old. Okay, you've sold me! I need this for my 2 acre lot! 3.5 acres in NC, which has almost turned into a rainforest this summer. This would make my husband's life easier, which would in turn make my life easier. Save our marriage Steve! This would make my life easier because I have a huge lawn and an old mower which needs to be worked on every time I go to cut grass. It also needs work in the spring of every year to get it going which costs a couple of hundred dollars. Please save me!! My husband would be thrilled. He loves to mow and would be honored to test this puppy out! My husband would love this! We have a pretty big yard, and it would make mowing so much easier! I just realized the way I replied leaves you no option to contact me.. duh! Mowing two lots with a push mower is good exercise, but it's not much fun. A riding mower would be great! Wold love to win this mower as having to weed eat around many trees is taking a toll. My old wheel horse is on it's last leg and this wold be a answer to my prayer. Would love a Riding Mower!! I have the worlds most wonderful neighbors. They have retired and now my wonderful neighbor has turned into the "Yard Boy". Picture a " Yard Boy " at 72 years old. Nothing in this world would make us happier than to be picked to win this awesome Troy-Bilt Neighborhood Rider. This man, like us all, has worked all his life. He is the kind of man that would seriously take his shirt off his back and give it to you, if you asked. So to be able to win this AWESOME Troy-Bilt Neighborhood Rider for him would be incredible. I would post pictures of this very proud man on his New Troy-Bilt Neighborhood Rider. Thank you for your very funny story of when you were a kid and for making this offer. I am sure, who ever wins the Troy-Bilt Neighborhood Rider will use it with as much pride as my neighbor has. Again THANKS!! I have 3 acres that I mow with a regular mower. Would this make my life better. . .heck ya'. Pleeeeeeeeeeeeeeeeeeeeeeeeeeeeeeease? I really need this! I would love to have this mower! It would make mowing during those hot humid summer days much easier. What a treat it would be! I have to jump up and down on my old mower's clutch in order to get it to start. . . with 10 acres to cut, and all the rain we have gotten this year, that is very stressful. some days you’re the windshield, some days you are the bug ! I could really use this! I would love a riding mower even with a self propelled mover it's way to hard for me to manage. The riding mower that I am currently using is on its last leg! I am sure that one day I'll be half done and it would die. This causes me to worry every time I start the thing up. A new mower would make my life easier by causing me less worry and an enjoyable experience! Can a riding mower out run mosquitoes? I could have used one today! My yard is full of raised beds, boulders, and trees. So, it's not the size of the yard, its the complexity. :) So long story short, if I could mow while seated (on something with a cup holder) my mowing life might go from mild agony to a bit of joy! I would love to win this mower, our mower broke down a month ago and I haven't had the money to get it fixed. We have been blessed with a lot of rain this summer so the grass has grown as tall as the hammock! Thank you for the chance to win! My life would be so much easier if I had a dependable riding lawn mower. Ours is so old that I think it should be in the Smithsonian Institute on display as an antique! Winning a new one would definitely make my life easier. (I left a comment yesterday, but I don't see it on here). We could really use a new mower. My husband has to manhandle all kinds of wires and switches before he can get ours to start - one more good reason not to mow - ha! Thanks for a great giveaway!! This sure would be super duper :) thanks for the opportunity!! My husband works two jobs to support our family, so we can homeschool our children. I do a lot of the yard work, as he is not here during daytime hours. I have a heart condition, and have to take a lot of breaks. Being able to ride and nt push would just be a dream come true for me. 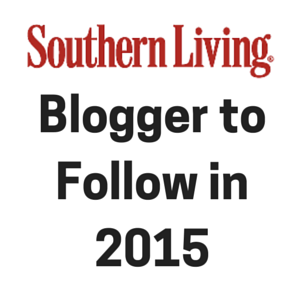 We LOVE your blog! Thank you for giving someone the chance to win this! How amazing! I cannot even imagine! Best of luck, everyone! I do all the lawn mowing at my house. Basically because I am not particularly fond of the way the hubby does it. Please make my life easier by letting me win this fantastic mower! It would make my job a whole lot more enjoyable. This would be so sweet! I recently retired and have an acre to mow with a push mower. It took me a couple of hours 25 years ago when I bought my house, but now takes a couple of days broken up into to 4-6 hitches. I had actually looked at buying this but could not afford it just now. 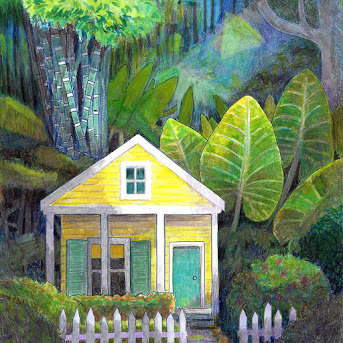 Using a rider would leave me so much more time to beat back the jungle that my yard is becoming! Thanks so much. I tried to move to a townhouse, but no.... the husband was not too happy. So off to mow the very large yard. It would save me time to spend with my three little boys! It would save my hubby time outside in the AZ heat! Blegh! Another day another entry. Crosses my fingers! I am getting in another entry. Thank you for giving us multiple chances to win. This is really going to bless someone! Here I am again. Wouldn't be awesome for my husband to come home from working out of town, to a new lawn mower?? I wonder if I would even get a turn:) We would all want to now with this sweet ride! Thanks again! This new mower would make my life easier by never having to worry about getting it to start! It would make my lawn mowing chore so easy and fresh!!! I would love to win this riding mower for my husband. We moved to Savannah, GA 6 years ago and now have a 1/4 acre of lawn. Before this, we lived in Havertown, PA and only had a postage stamp size lawn. Currently, my husband is using an electric mower but has to mow the lawn in sections over a 3 day period because it's just too much to do in one day. With all the rain we had this summer, he has been one busy mowing hubby. Thank you for the opportunity to win and we will keep our fingers crossed (when we are not mowing). 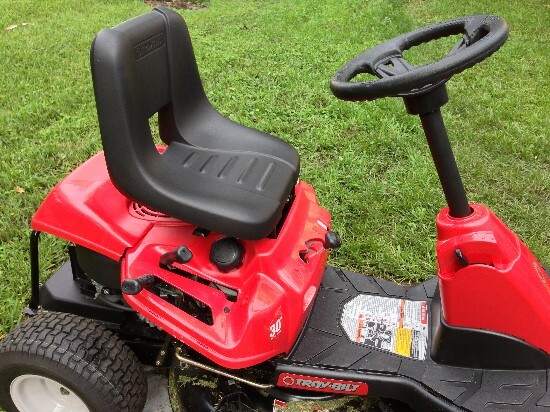 I would love to win this mower to make my life easier because I wouldn't have to worry about whether or not my current mower is going to start when I go to cut the grass. I desperately need a reliable machine! I am putting in a third entry. I know what this mower would mean to me. It would give me such a relief and peace to not be overwhelmed and worried about my heart while cutting. Everyone who entered also has good reasons for wanting this. Thank you for yet another chance. Have a great weekend everyone! If I win, I'll go Tool Time and install a jet engine on it. Promise. I have a half acre. I currently use a reel mower. 'Nuff said! Thanks for the opportunity! Second time to enter - thanks again for a great giveaway! Today it poured rain. The grass is growing!!! We mow our hilly one acre yard with two push mowers (one is self propelled and one isn't). It would make the hubby incredibly happy to have a riding mower. Getting closer!!! I hereby promise to keep the grass cut, if I win ;) Thanks again for the giveaway!!! I guess I'd have to blog about this, and update all of my social media haunts -if I win. Good luck everyone. We will know soon. Have a safe weekend! This mower would make my life easier by being reliable. My current mower is quite old and I don't know how much longer it will hold on. Monsoon season is here! That means the grass is growing like a weed...so hard to cut it when it's long with our push mower! Great post! I'm with you--mowing is hard work!!! I dream of a day when I can skip the lawn entirely and cultivate a prairie instead. In the meantime, my current reality is a garden next to a suburban lawn. My husband gets a headache every time he mows. I've been stepping in to help him out, but it's not an easy task with our push mower. A riding mower would make short work of an otherwise difficult and time consuming chore! I am getting in another entry. I thought about this giveaway today as I cut our yard. It is so hot here in Florida! :) It made me really appreciate Troy Bilt for being so generous. I know this is truly going to change someone's life. Thank you for the effort you put in to review it and run the giveaway! So exciting! I've looked at the grass this week thinking i should wait until tomorrow to mow;) good luck everyone and thanks again for the contest! My life would be easier with this mower because I wouldn't have to worry about it starting. My current mower is so old. I don't know if we get another chance to enter today. Worth a try right? So here I am! Good luck again! You can enter til 9! Ah!!! My husband every time the grass gets high says he wants a law mower that he can ride!! THIS IS IT! We live on an almost 12,000 sq foot lot and we need this so bad! Amazing giveaway! Too much mowing. (Or perhaps moving too many rocks.) Now the husband needs knee surgery. How will we keep up with the lawn? I didn't know you could still enter today, and I missed it, I believe. I wanted to say a final thanks! 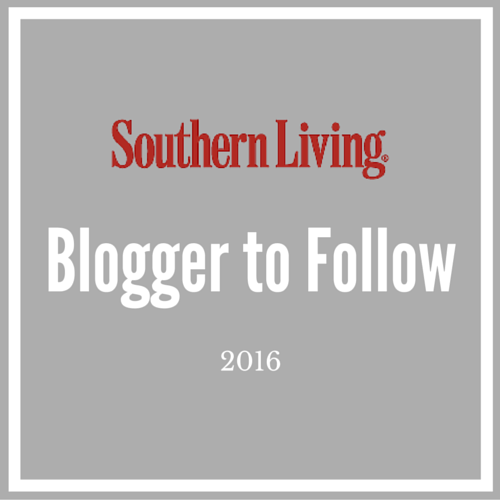 We LOVE your blog! Thanks for all of the chances! I really need a good mower like this so that I could mow our yard without my husband having to "fix" his mower every time the grass needs cutting. To have a mower that would actually work would be heaven! First of all I wanted to thank you all for your kind words and thoughtful posts and wish I was able to respond to each one as they were posted, but the response has been too big to keep up! I unfortunately only had one mower to give away, but I did randomly select the winner last night and it was Stephanie Gossett! For those of you who still seriously need help maintaining your lawn, send me an email to steve_asbell@therainforestgarden.com and I'll try to help you come up with a solution to make it easier. As many of you know, my mother was handicapped and had to rely on the kindness of friends and strangers to keep up with the HOA requirements. I feel for ya! Congrats Stephanie! You're gonna love it! I have looked at a lot of riding mowers and Troy looks to me as the best way for me to stop hating Spring, Summer and Fall because of the mowing. Being a five-by pass open heart survivor I am thinking to continue surviving at age 70, 12 years after my bypass surgery, I am going to have to bite the proverbial bullet and buy a rider. With Congress having taken away 60% of my Social Security just because they don't want to pay it, the purchase could be difficult, but where there is a will, God always provides a way! I think Troy for all the people they have given a rider to, that is something that must please God! Well done.